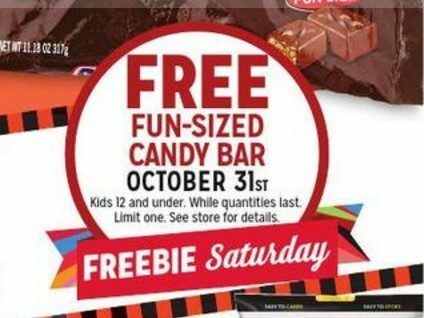 FREE Candy Bar At Kmart On Halloween! You are here: Home / FREEbies / FREE Candy Bar At Kmart On Halloween! You can head over to your local Kmart on Halloween and get a FREE Fun-Sized candy bar for your kids 12 and under! Be sure to check your store before you head over to make sure they are participating and it’s first come, first served so don’t dawdle! If you haven’t seen our full list of Halloween FREEbies, be sure to click here to check them out now!